Salt-X = The best salt and salt corrosion fighter! Miraculously removes salt from virtually any surface and leaves a protective coating that preserves and extends surface life! 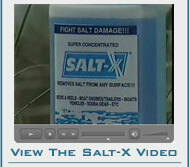 SALT-X fights: Rust, Corrosion & Salt Water! 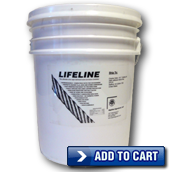 Perfect for fishing, boating, cars, and much more! SALTBUSTER® SUPER CONCENTRATE was designed to take advantage of the SALT-X technology by combining a general purpose detergent with SALT-X. Clean and protect with SALT-X and detergent all in one. PHEW-GO Super Concentrated odorless deodorizer & cleaner is designed to remove all organic odors and soils from virtually any surface. PHEW-GO eliminates offensive organic odors and leaves NO after odor! 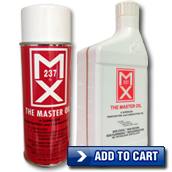 MX-237 & Lifeline, are superior, penetrating & lubricating oils which: lubricate, inhibit corrosion, loosen rust and dissolve carbon deposits.They are: Non-Toxic, Non Drying, Non-Flammable, and Non-Conductive!